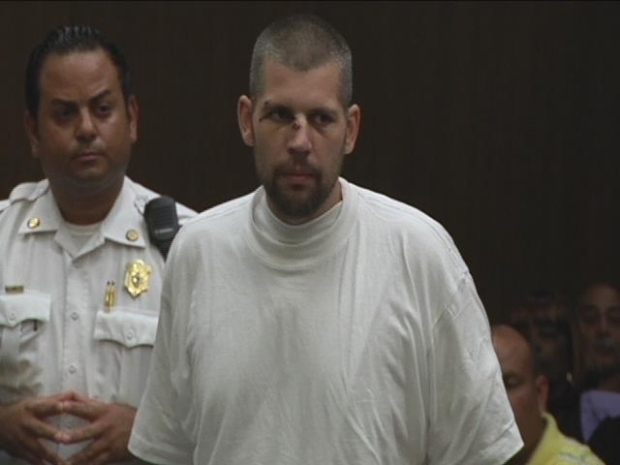 A man accused of causing a crash that killed a Connecticut state trooper appeared in a Massachusetts court on Tuesday to face an unrelated charge and is free after paying $675. With a brace on his leg and scabs on his facem Michael Pajak, 32, of Enfield, was in Springfield District Court on Tuesday, charged with driving with a suspended license. Connecticut state police say Pajak's pickup truck went out of control on Interstate 91 northbound in Enfield last Thursday and smashed into a state police cruiser parked on the right shoulder during a motor vehicle stop. Trooper Kenneth Hall died. Pajak and a passenger in his truck were injured. WWLP-TV in Springfield reports that Massachusetts authorities charged Pajak after he was released from Baystate Medical Center on Monday. Pajak was supposed to appear in New Britain Superior Court the day after the crash on distracted driving and failure to drive in proper lane charges. Those charges stemmed from an incident in May. He has not been charged in connection with the accident that killed Trooper Hall. On Tuesday, his attorney said he did not know what Pajak's plans are now and he had no comment.